Not sure about you guys but we are itching for a nice long weekend of fun and food. 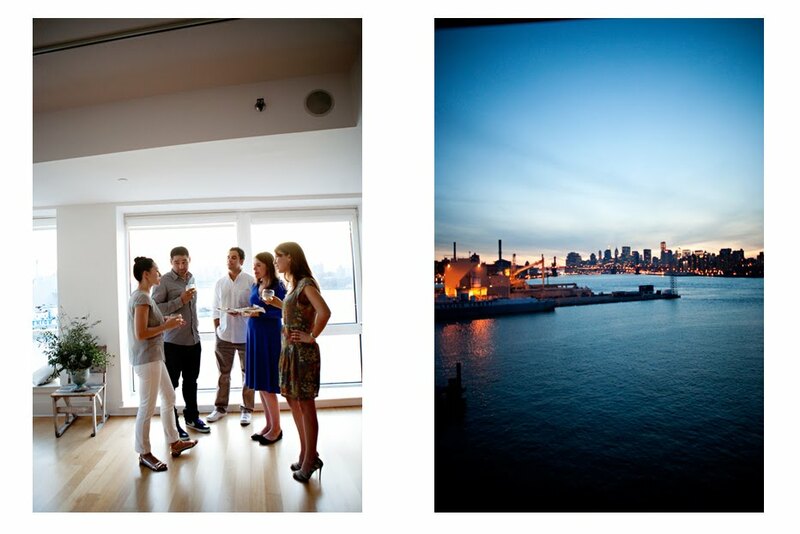 Here are some great spots to check out if you're in the city....Happy Holiday Weekend - !! Black Gold, 461 Court Street, between Fourth Place and Luquer Street, Carroll Gardens (347-227-8227 Opens Saturday; free coffee all day. Totale Pizza, a new Neapolitan pizza spot owned by the same guy behind 2 Bros. Pizza, and with an Una Pizza Napoletana alum working the ovens. 36 St Marks Place; 212-254-0180. The Fulton Stall Market, a series of storefronts and stands will open again for the season on May 30, operating on Wednesdays and Sundays from noon to 6 p.m. through Oct. 3. Among the vendors will be Bread Alone Bakery, Lavender by the Bay, Ronnybrook Dairy Farm, Sour Puss Pickles, Cascade Mountain Winery, Yummy Coffee and several farms with produce and eggs. In continuation of supporting great local talents, we enlisted one of our absolute favorites for our paper design :: Linda & Harriett. Liz of L&H is one of the most talented stationary designers we’ve come across and we’re lucky enough that she is a local Brooklynite. For years L&H has turned out the most beautiful custom invitations + stock note cards that are whimsical and bright, artistic and unique. Recently, she has taken L&H in a new direction, and will be creating larger projects one at a time (for instance her famous calendar, and the just debuted birthday calendar). For our paper element we needed the bar signs + labels we talked about, labels for our Frankie’s Olive Oil guest gift, and these beautiful recipe card/books. We told Liz the theme and let her run with it. She started with thick gorgeous paper and began hand dying it for that old, found in your grandmother’s attic warmth. As it turned out tea produced the best results. For a design, she incorporated a stamp she had made from handsome antique wallpaper with a floral print. We could not ask for work that sat better with our display, or was more outstanding on it’s own. It created such nostalgia, we could just see coming across it in a shop on a tiny back road of Florence, or in a kitchen stack in the hills of Tuscany. You can buy her products online here. Thank you Liz !! Also, as our take home gift (in addition to our recipes) we gave out small bottles of Frankie’s Olive Oil. 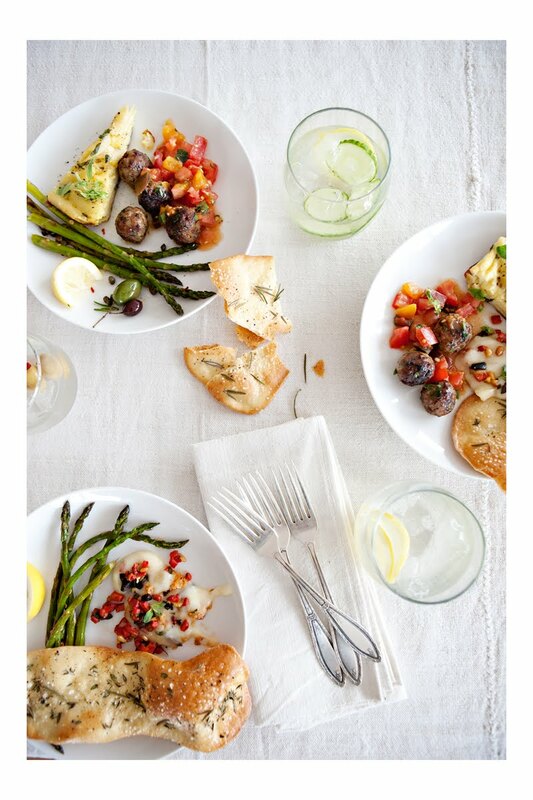 This is something fun you can do for dinner parties at home. To keep down cost, buy a big bottle and distribute it to much smaller. 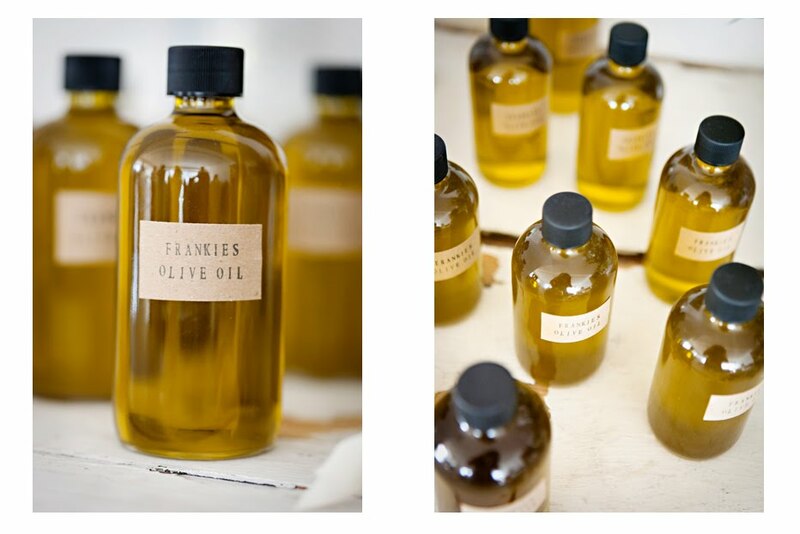 This particular olive oil is from some of New York’s favorite chefs – The Franks ! who own Frankie’s 457, Frankie’s Clinton Street, two Café Pedlars, and Prime Meats. Their oil is so above and beyond, they began selling it to the public. Since we used it in our dinner, we thought it was a great continuation of the theme. 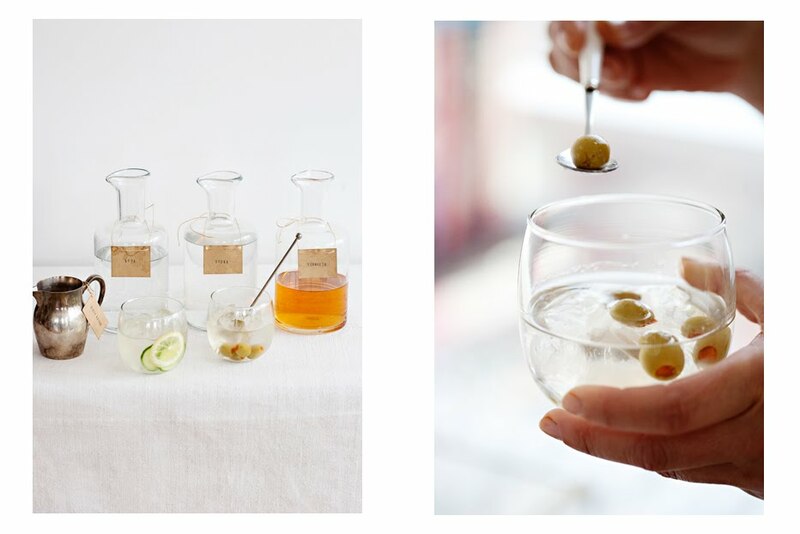 Now when our guests roast veggies, make tomato sauce, or just dip bread, they will be reminded of our fun cocktail party ! Definitely check out a Franks restaurant if you’ve never tasted their delectable meatballs, and you can buy their oil here. 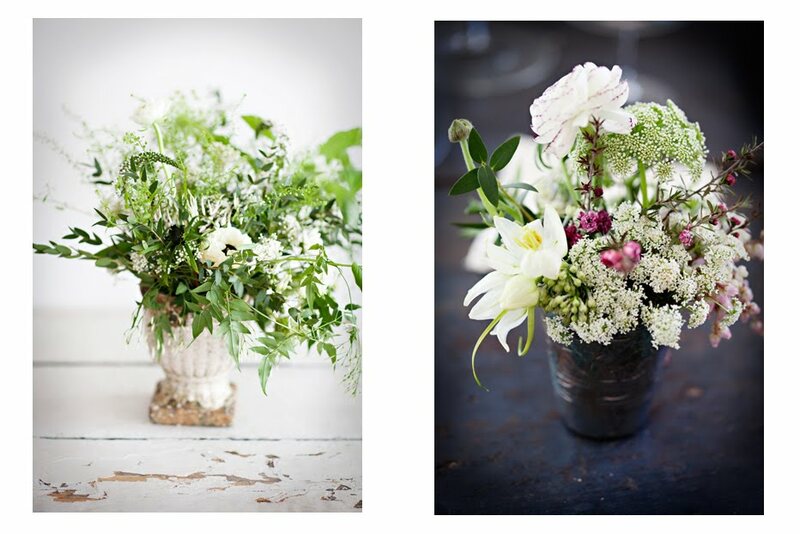 Incorporating beautiful floral is one of our favorite parts of every event we do. As always, local vendors are especially dear to our hearts, and local and beyond Sarah Ryhanen from Saipua is one of the most talented florists we know. 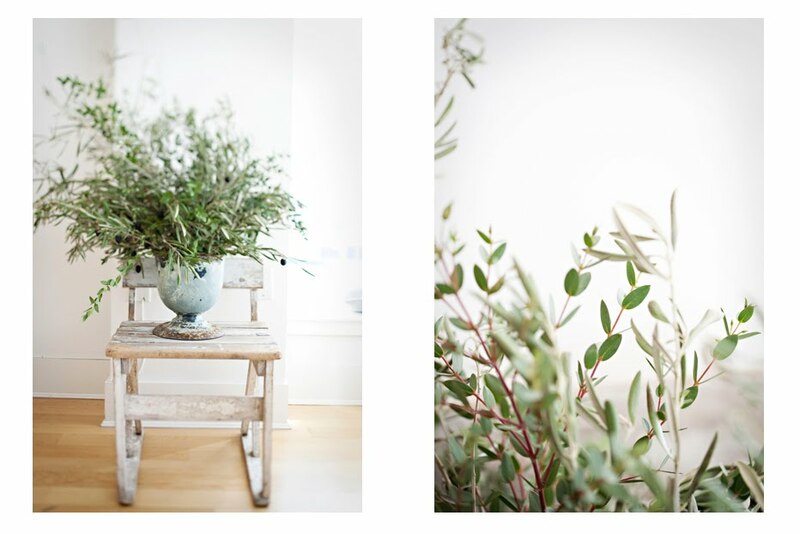 The one guideline we gave Sarah was that if at all possible, we would love olive branches. Can you think of something more beautifully rustic or Italian countryside ? We certainly couldn’t, and we were lucky that Sarah could locate them. This might be a difficult item to find, but there are plenty of beautiful branches that could stand in ( look for something with that silvery hue, and perhaps a black pop in flowers to mimic the olives ). Beyond that, Sarah took the reins and arranged in some stone urns of ours and some of hers (ours from Terrain at Styers). 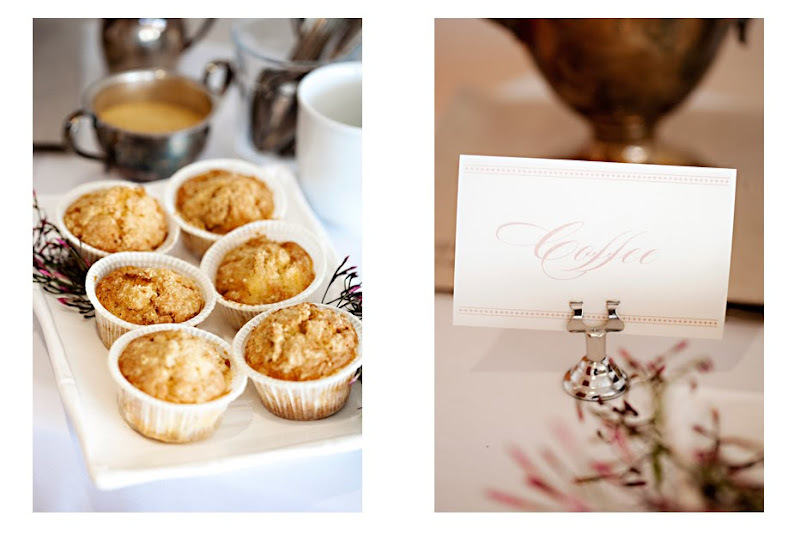 These gorgeous touches came big and small, from statement pieces on chairs, to a sweet soft touch on the gift table. These touches gave continuity to the room and warmth to the theme. Sarah’s ability to create these organic displays with the perfect amount of movement and beauty is more than we could ever hope to create ourselves. But you can learn from the best at one of her classes, or use her services. You can visit her storefront at 147 Van Dyke Street, or her website and blog. Thanks Sarah ! 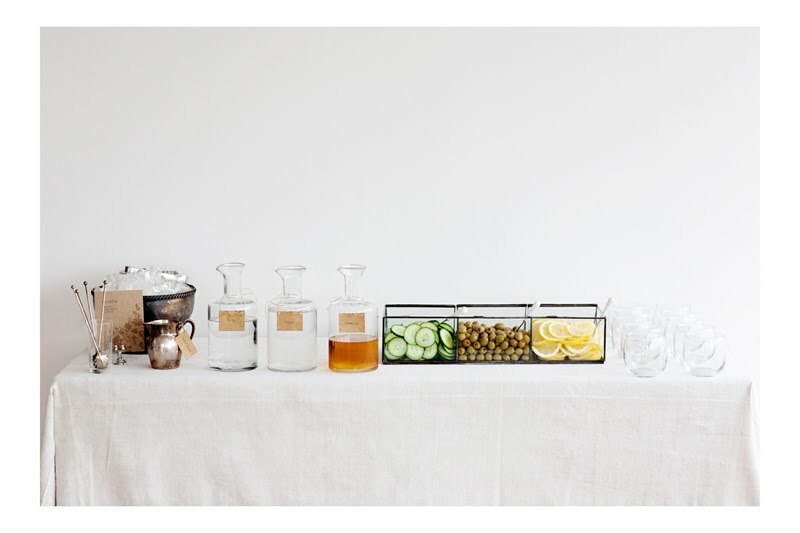 For the cocktail portion of our Rustic Italian party we created a “ make your own “ Martini Bar where guests were invited to mix a drink to their liking with Vodka, Vermouth, soda water, “ dirty water, “ and various garnishes ( cucumber, olives, + lemons ). In case guests weren’t confident in their martini making abilities we included a beautiful hand-stamped, coffee stained how-to sign by the very talented Liz of Linda & Harriett (more on that later). Partially because our buffet had a lot going on visually, we kept the bar much cleaner. 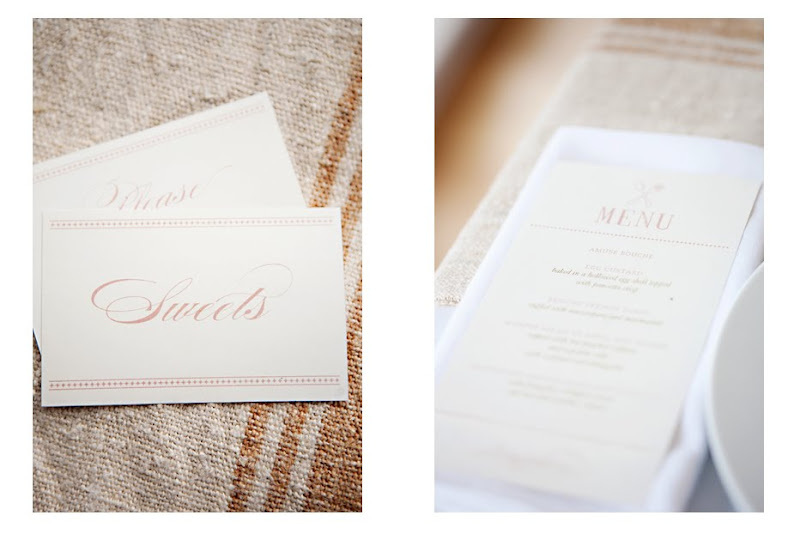 We used a beautiful neutral woven table cloth, and a lot of glass for a crisp, clean look. We purchased our decanters at Moon River Chattel here in Brooklyn (often a go-to for Sunday Suppers décor !) We loved their unique simple shape, with a perfect neck for hanging nametags on (also L&H). Glass was a must for our garnishes because of how beautiful simple individual ingredients are in this form. Don’t hide them ! The piece happens to be a terrarium from Terrain at Styer’s ( mail-ordered ). Of course, there are plenty of clean glass vessels in every home you could use instead—buying is certainly not a necessity. With these orderly, more modern shapes, we were sure to incorporate rusticity. 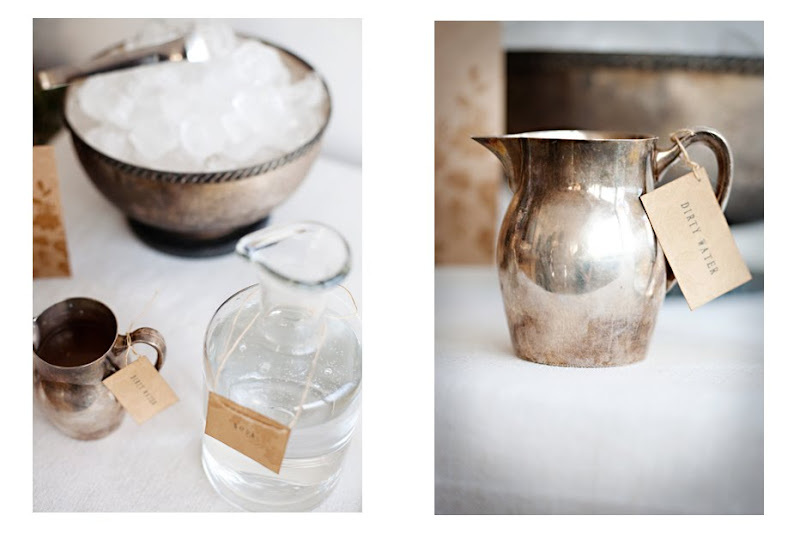 To this end we used lovely tarnished silver pieces for our ice bucket, our dirty water, and out stirrers. Again, the dirty water container is simply a creamer, and the “bucket” an old bowl. Be creative ! 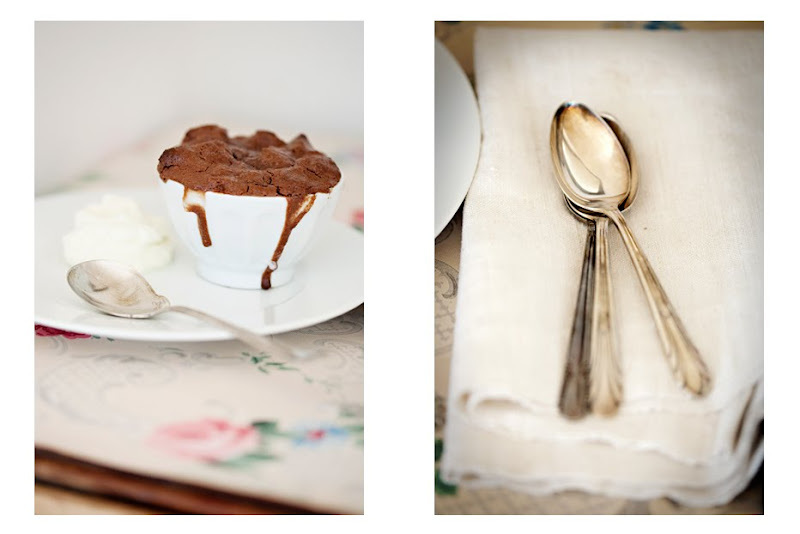 Sunday Suppers :: Rustic Italian + Martha Stewart Living !!! You might remember in the beginning of the year we said we were working on exciting things. 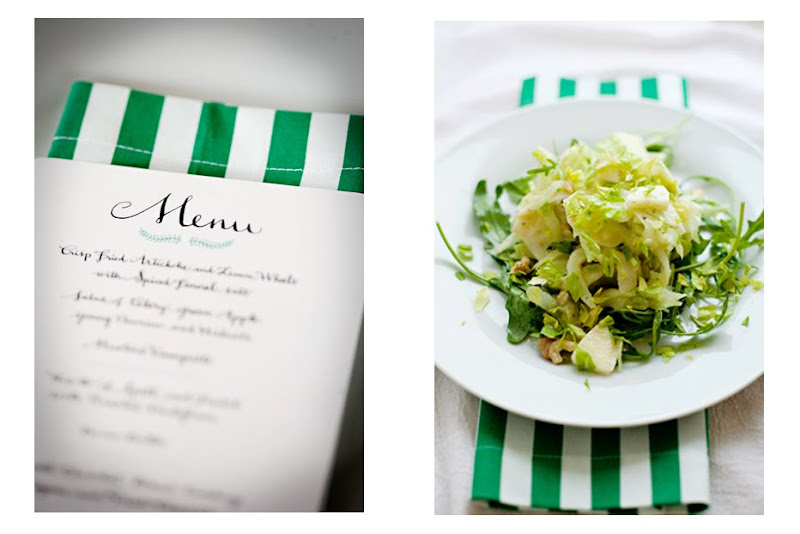 Well here is a big one : a special edition Sunday Suppers for our very favorite Martha Stewart Living, Styled and Photographed by Karen Mordechai ! You can check out the story in MSL’s June issue on stands now and online here + we’ll be blogging about all the great details and recipes for the coming weeks. As with all of our suppers we started with a concept. 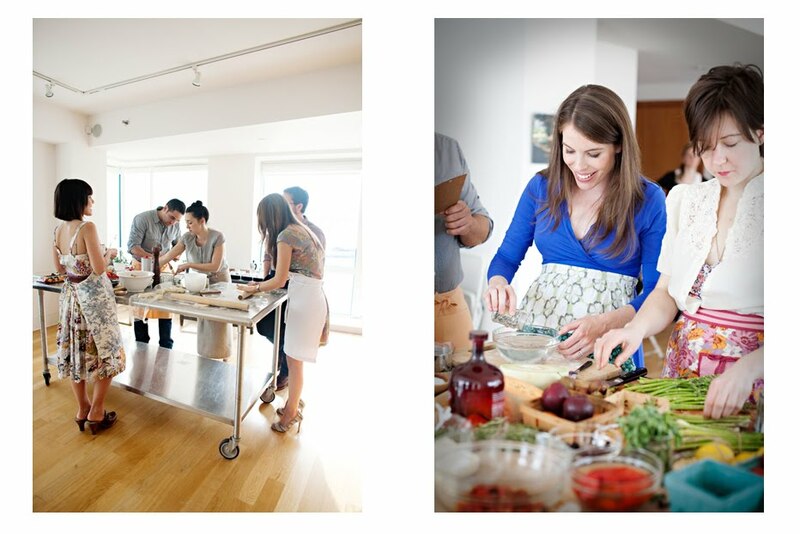 This time we collaborated with Shira Bocar, our guest chef who works in the test kitchen at MSL. 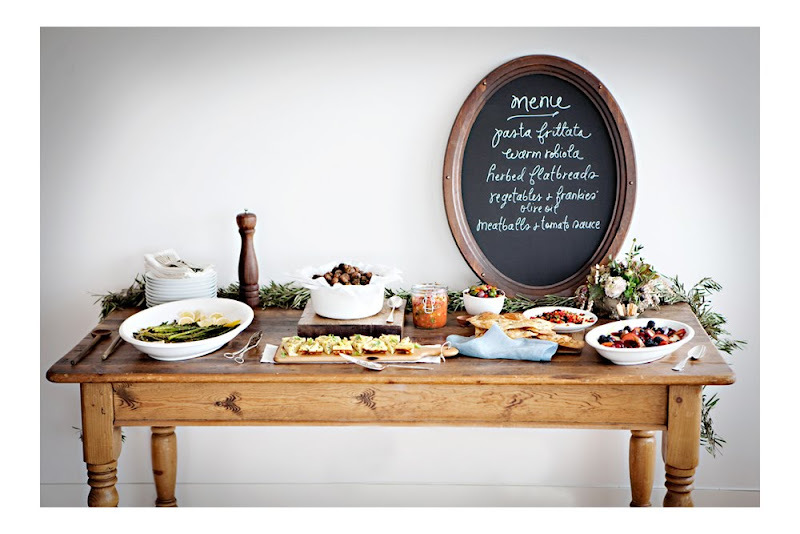 After choosing a rustic Italian cocktail party we set to work on our buffet table and vendors. As you all know, a buffet table is a bit unusual for our suppers as they are normally seated meals. This meant working on big serving dishes that aren’t usually a part of our repertoire. 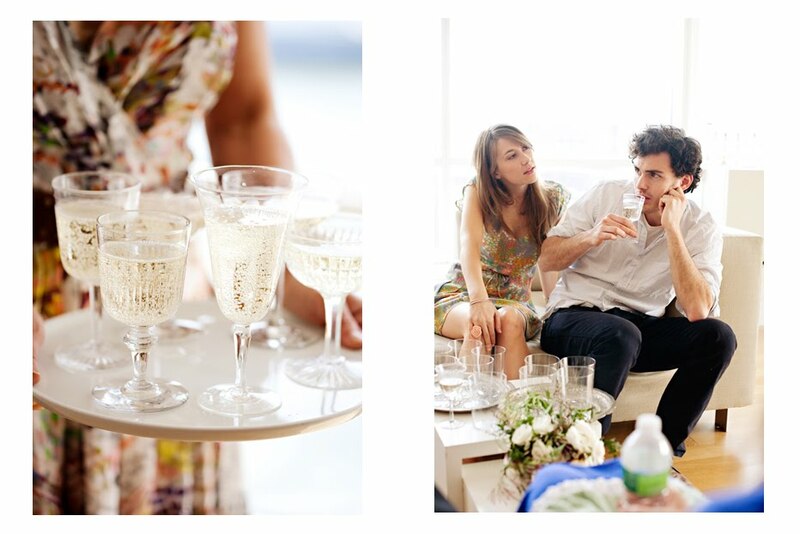 We decided on four tables: the main buffet, the bar, the favor table and a dessert/espresso table. For the buffet we chose a big heavy duty old farm table. We needed this piece to ground the room, showcase the theme, and comfortably house our yummy spread. Once we chose our heavy knotted wood surface, we opted for lots of white dishes – both because they would pop on the dark surface, and because the colors of the food would pop in them. 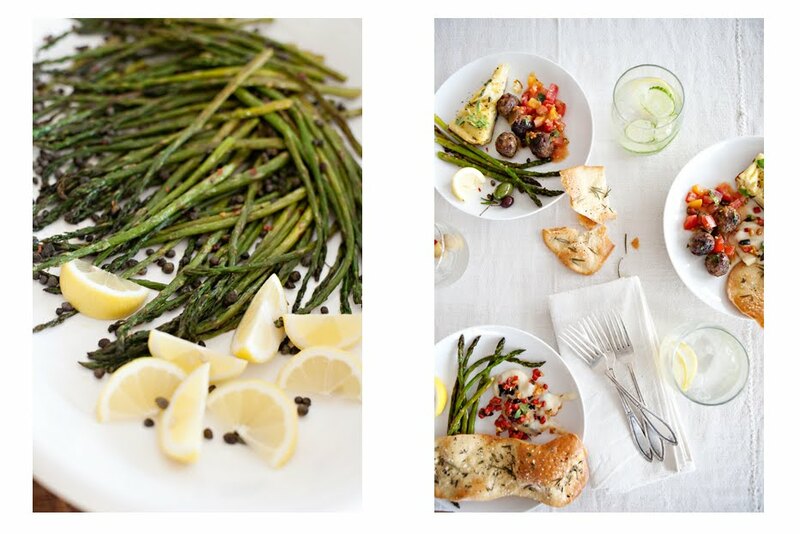 Easy pieces from Crate + Barrel and Sur La Table housed our asparagus, robiola, and fruit, while household staples like a Le Crueset Dutch oven, everyday glass jars, and a cutting board held our meatballs, tomato sauce, and frittata. In true Italian style, the flatbreads went right on the table. 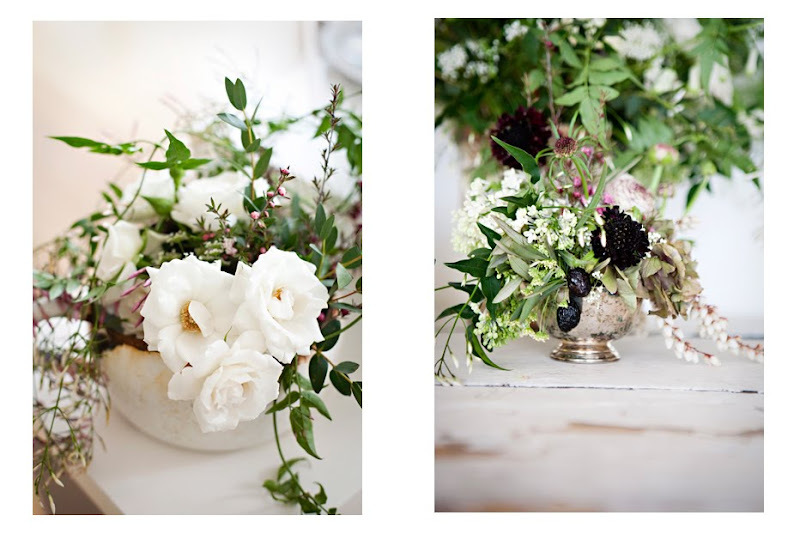 To keep up our rustic look we used vintage serving pieces, displayed a real olive branch garland and old stone vessel with beautiful flowers (more on that later). When you’re trying this at home be sure to keep the table visually interesting: it’s important to vary heights (just a tall pepper grinder, or a block under a pot can make a huge difference!) and shapes, while keeping it in a somewhat uniform palette. 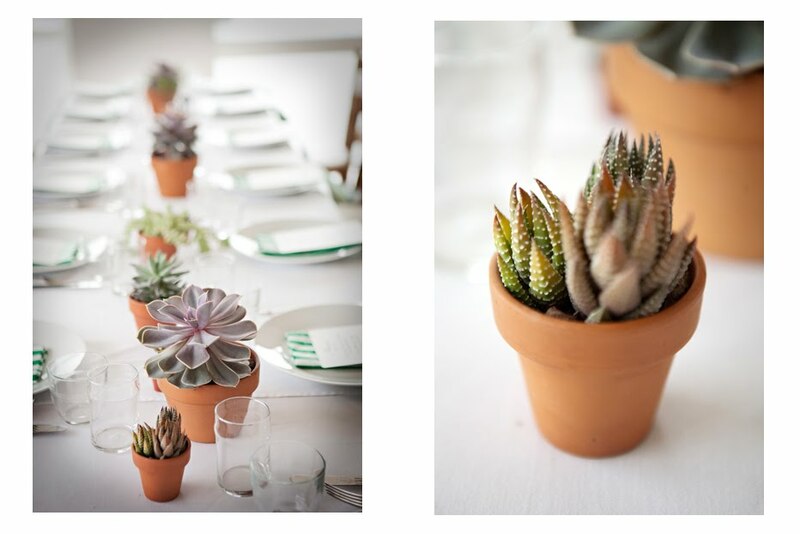 We have pops of color (mostly edible) that keep it from being dull, but the display is largely white + neutral. Our favorite part about this is how many objects you probably already have in your home—none of it is fussy. Even our menu board is just an old frame with black heavy cardboard cut to size (frame from brook farm). 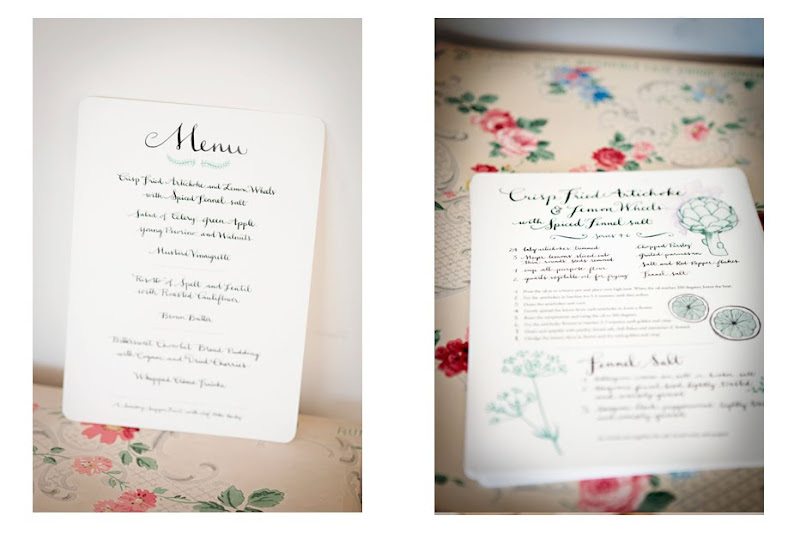 The very talented Brynn from Paperfinger wrote the menu is casual and playful calligraphy. Our guest list at this event was a bit closer to home than most Sunday Suppers. You probably realize this class was never opened to you all to join. Instead this one was invite only (not because we don’t love all of you) and filled with local Brooklyn vendors, and New York friends we find inspiring and creative. Some guests you’ll hear about later in the week, because they also had a hand in the creating—Laura O’Neill, Ben Van Leeuwen of Van Leeuwen Ice Cream, + Sarah Ryhen of Saipua Flowers. In addition, Camille Becerra, Vincent Rotolo, Joanna Goddard, and Alex Williams joined us. Camille is an amazing Chef who created our picnic menu, is a former restaurant owner, food blogger, and most recently pop-up restaurant curator/chef, and her boyfriend Vincent is a pizza connoisseur and debt analyst. Joanna Goddard is the famous writer/blogger behind the Cup of Jo Blog and a magazine writer, while her husband Alex is a reporter for the New York Times. And of course, Karen’s very helpful husband and gaming expert, Ken Rivera was on board. We had the pleasure of working with the incredibly talented Eva Juliet on the Papers and favors for our last supper with Peter Berley. The menu was a vegetarian feast and so Eve's botanically inspired kitchen drawings were just the right fit. Eva's work is romantic and whimsical and she sells the most beautiful prints online here, you must click over ! Our favorites include this spoon print , and these stunning herb drawings. We asked Eva to create the dinner menu, and a recipe print for all our guests to take home. 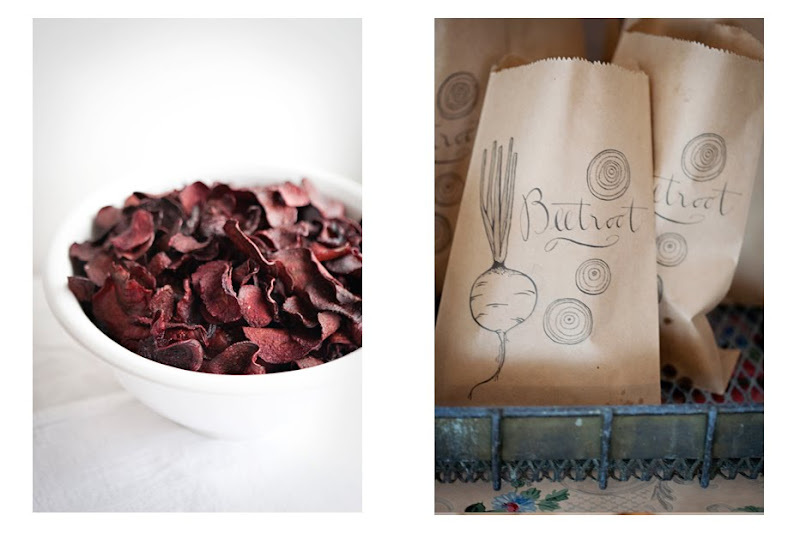 And as a final treat, Eva designed these beet root bags for our guests, filled with these delicious beet chips, it was the perfect ending to a vegetarian feast. 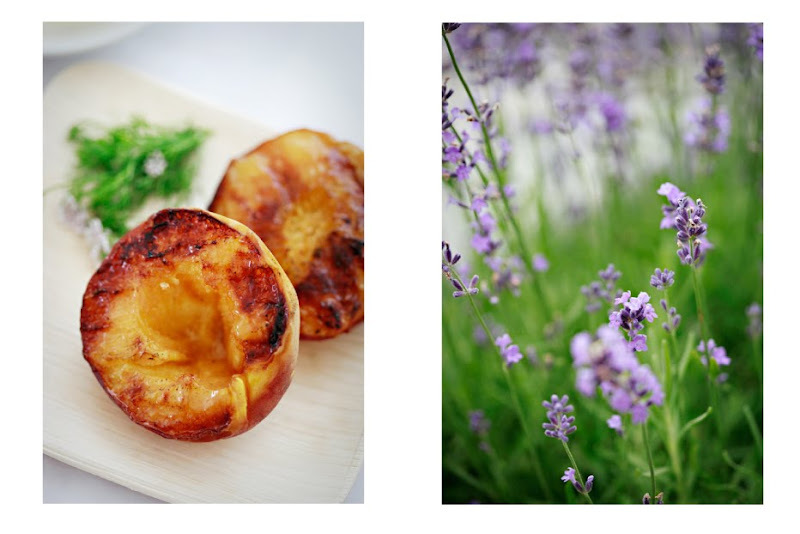 Check out our recipe below and a special thank you to Eva again for her beautiful contributions ! Soak lentils 4 hours then drain well. Toss the cauliflower in 2 tablespoons olive oil, roast in the oven at 450 degrees for 35 minutes until golden brown. Remove and set aside. Brown the butter in a heavy saucepan 4-5 minutes over medium heat. Add the leeks and ground caraway and 1/2 teaspoons salt. Stir to prevent the butter from burning. Lower the heat and cook covered for leeks 8-10 minutes until the leeks have softened. Add Farro and lentils and stir 2 minutes until fragrant. Stir in stock 1/2 cup at a time, stirring until the liquid has been absorbed before adding subsequent stock. When 3/4 of the stock has been added, stir in the cauliflower. Cook 3-4 minutes longer until the risotto is tender and still a little bit soupy. Stir in the cream, cheese, lemon juice, lemon zest and dill, season with salt and fresh ground black pepper. Divide among warm soup plates and serve immediately. In a large bowl, whisk the eggs, cream, sour cream, sugar, cinnamon and vanilla. Whisk in the chocolate. Fold in the bread cubes, cherries and cognac. Let the mixture sit in a warm place for 1-2 hours to allow the bread to absorb the flavors. Preheat the oven to 350 degrees. Spoon the mixture into an 8 cup soufflé dish or pie pan. Place the dish in a roasting pan and transfer to the middle shelf of the oven. Pull the shelf out halfway and pour enough boiling water into the roasting pan to come halfway up the side of the dish, make sure no water comes over the side into the dish. Bake for 35-40 minutes until the pudding is puffed and set to the touch. Remove the pan from the oven and let cool slightly before serving. Serve the pudding with crème fraiche and dusted with powdered sugar. Garnish with mint if desired. This Friday + Saturday, Columbus Avenue @ 77th Street. 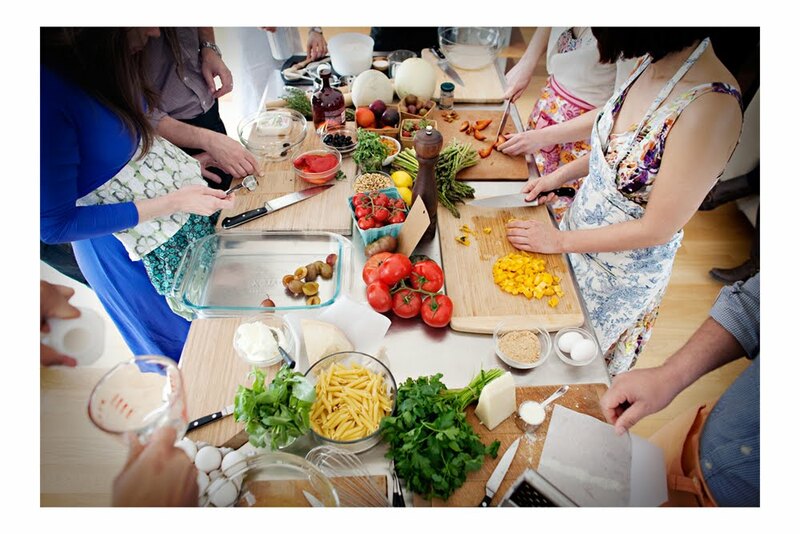 Saturday morning go see a demonstration of healthy Mexican cooking at Rosa Mexicana, Union Square. Call (212) 397-0666, extension 17 to make reservations for the 10AM lesson that is free ! There is a fundraiser this Saturday for our seasonal favorite :: The New Amsterdam Market. From 11am to 6pm, visit the New York Marble Cemetery ( East 2nd Street between 2nd Avenue and Bowery ) and buy herbs and plants in the morning, and enjoy food and drink in the afternoon. Tickets are $25 for friends of the Market, $35 for non. Peel away and discard any tough fibers from the celery stalks. Trim the celery leaves and reserve. Slice the celery on the bias into 1/8-inch thick pieces about 1 inch in length. Transfer the celery pieces to a bowl of cold water and refrigerate. In a small skillet over medium heat, toast the nuts for 3 to 4 minutes, shaking the pan for even browning. Transfer the nuts to a plate to cool. In a salad bowl, combine the lemon juice, mustard, garlic, honey, and salt. Whisk in the oil and season with pepper. Peel and quarter the apple, core and slice each quarter into 2 wedges. Cut the wedges across into thin slices. Add the apple slices to the dressing and toss. Drain the chilled celery and dry in a salad spinner or blot dry with a paper towel. Add the celery, celery leaves, walnuts, and cheese to the apples and toss. Serve immediately or refrigerate for up to 1 hour. Pour the oil in to a heavy pot and place over high heat. When the oil reaches 250 degrees, lower the heat. Fry the artichokes in batches for 3-4 minutes until they soften, remove one and cool briefly, then see if the leaves will separate easily. Drain the artichokes and cool. Gently spread the leaves from each artichoke to form a flower. Raise the temp and bring the oil to 360 degrees. 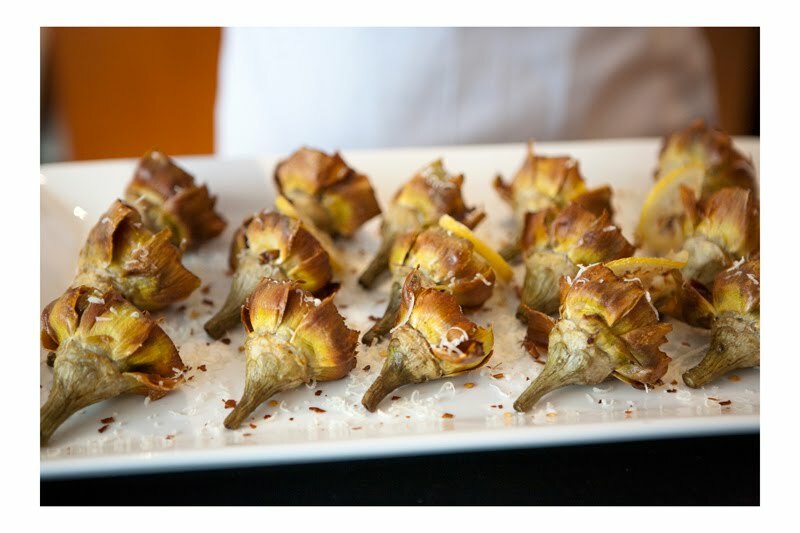 Fry the artichoke flowers in batches 2-3 minutes until golden and crisp. Drain and sprinkle with fennel salt, chili flakes and parmesan if desired. Dredge the lemon slices in flower and fry until golden and crisp. In a bowl, stir together the salt, fennel seed, and pepper. Our last supper was a vegetarian feast by Peter Berley. We were truly honored and thrilled to have Peter in our kitchen! 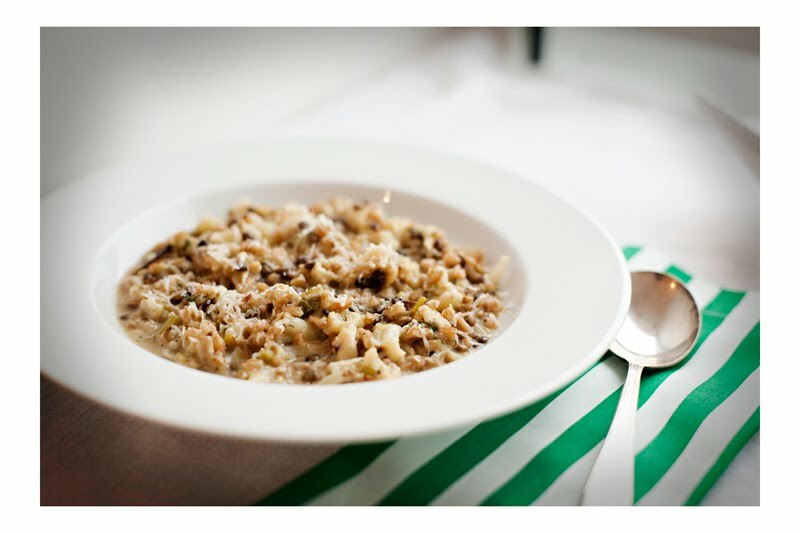 Peter is the former executive chef at the renowned Angelica Kitchen, here in New York. He has gone on to teach at numerous schools such as ICE and Natural Gourmet institute. 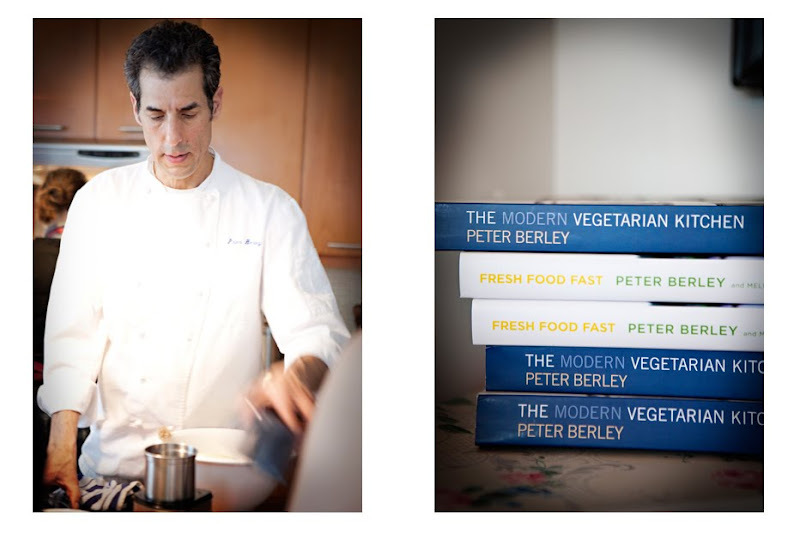 His acclaimed books include “ The Modern Vegetarian Kitchen, “ “ Fresh Food Fast, “ and most recently “ The Flexitarian : Inspired Flexible Meals for Vegetarians, Meat Lovers and Everyone In Between. “ He has also contributed to Edible Brooklyn, Food and Wine, Bon Apetit and many more. 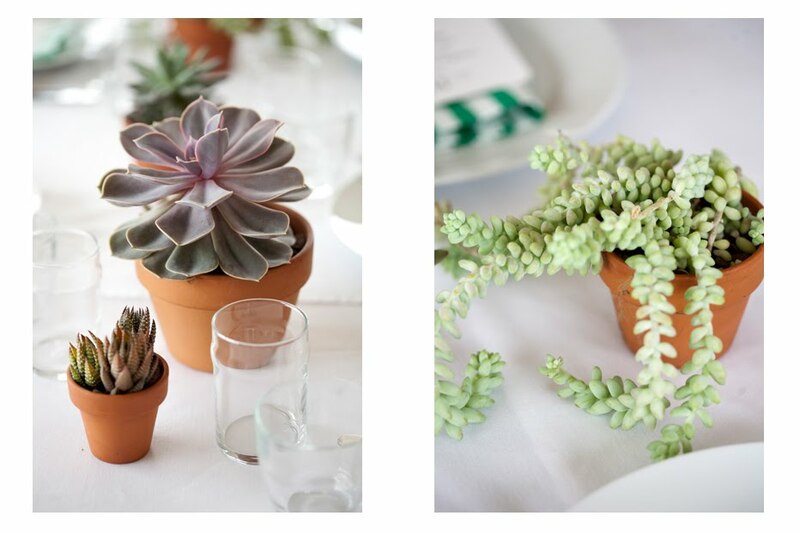 Decor : In honor of Earth Day we opted for a greener approach to the usual tabletop. 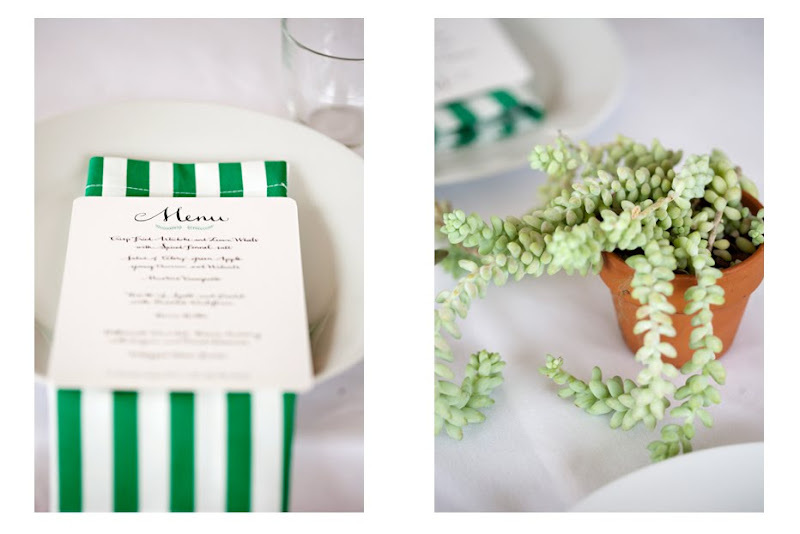 We decorated with an array of succulents from our flower market, added bright green + white striped napkins and a beautifully designed menu from Eve Legris (stay tuned for more about her and her beautiful creations later). To wrap up our last dinner with Marcey Brownstein and One Girl Cookies, we were honored to incorporate the work of the tremendously talented Viola from Chewing the Cud. Viola created beautiful menus for the table, as well as the small signs you may have spotted in the other posts. 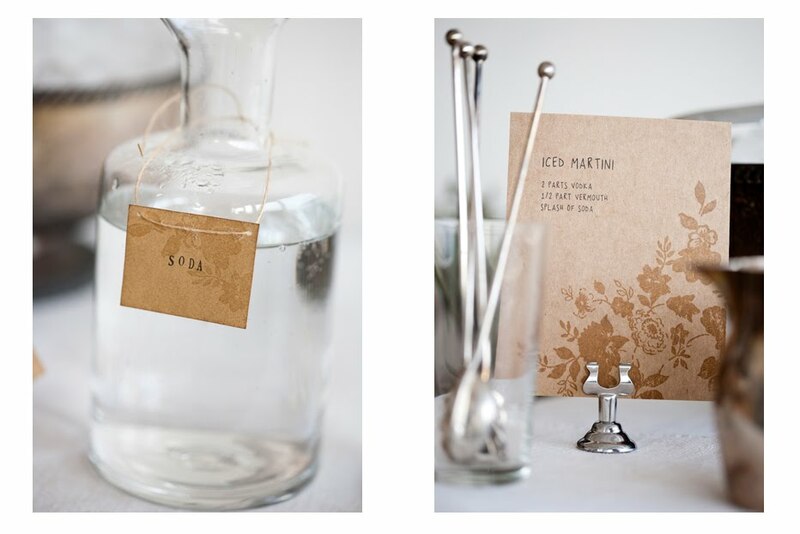 Viola also created all the gorgeous favors for this event. We never let our guest go home empty-handed, and this class was no exception. 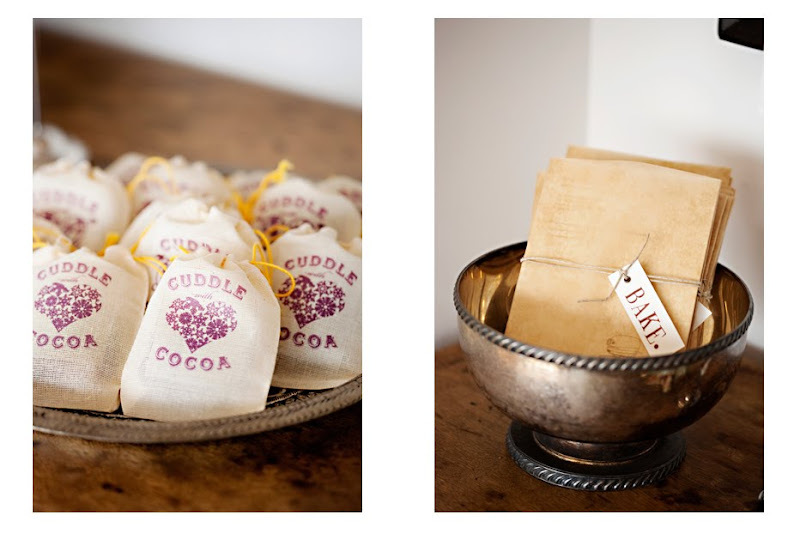 Guests received these adorable sachets that read snuggle with cocoa, in a lilac color, to match our decor. 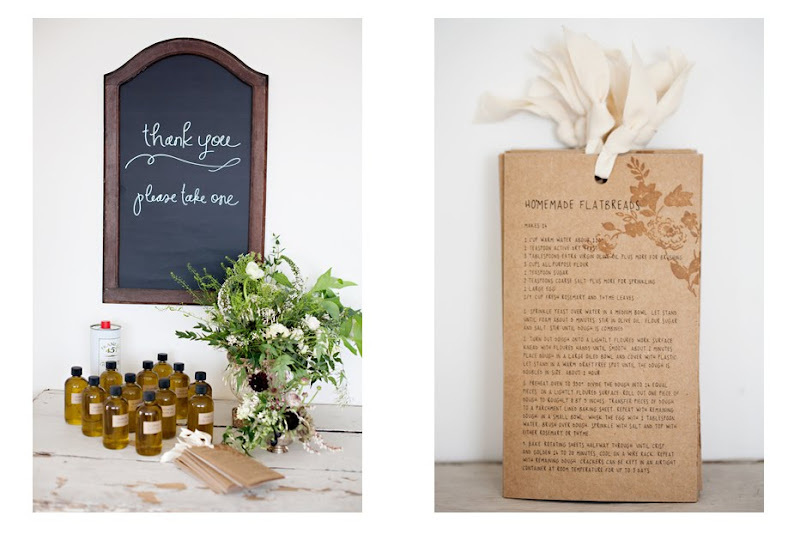 Viola sells the cuddle with cider version in her shop, along with a lovely array of wedding invitations, cards and gifts. 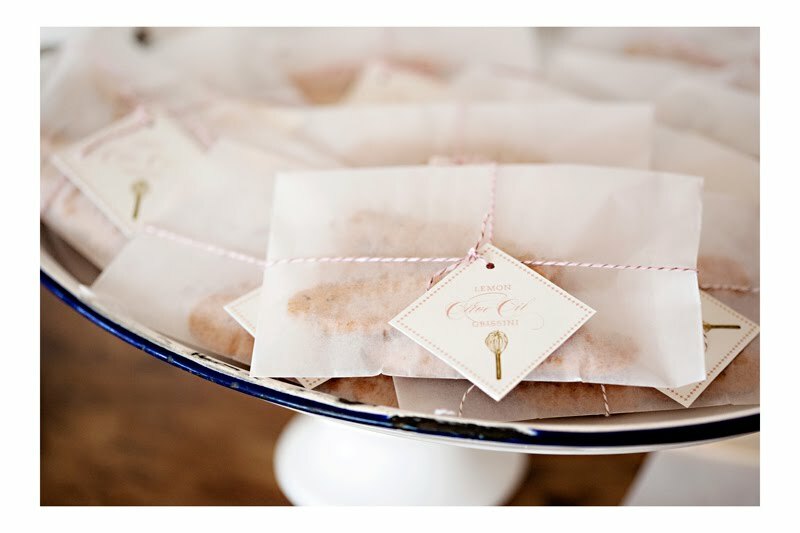 We also created packets of olive oil grissinis by One Girl Cookies and a parchment packet of recipes from the class. 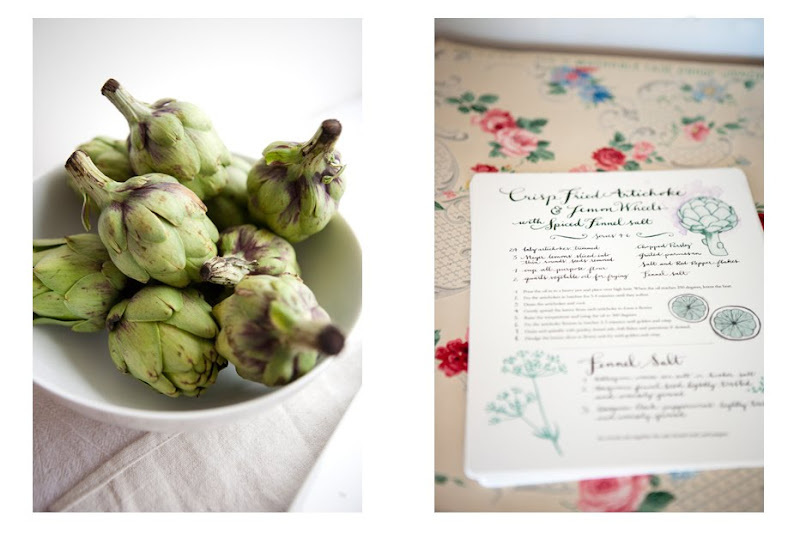 Check out the details and awesome little drawings that Viola incorporated into each recipe card. Working with Viola was an easy and truly enjoyable experience, she just gets it- and it was so exciting to get our beautiful bundle in the mail- so check out her website and store for more wonderful work ! In Viola's Words: Taking the cue from karen's inspiration boards, I wanted to create pieces that were feminine and sophisticated, but had a rustic/homespun feel to them. Feminine colors and typography were juxtaposed with whimsical illustrations and hand-stamped tags. 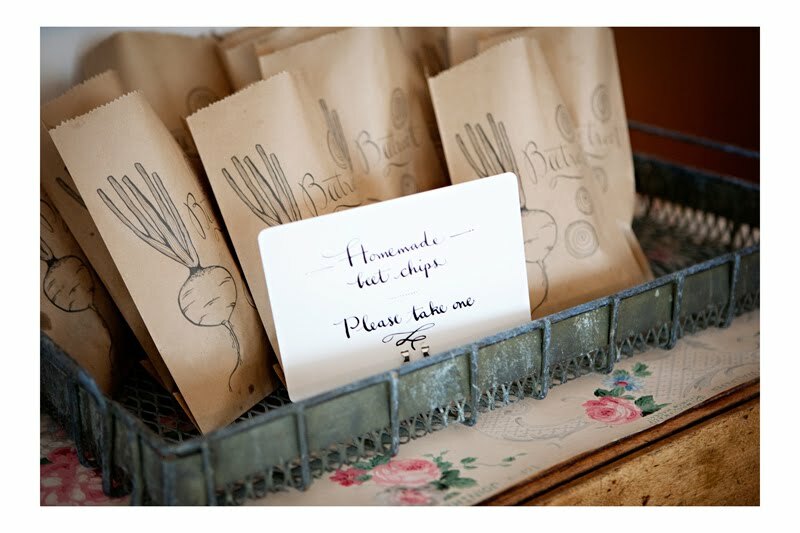 The phrases "eat", "bake" etc were a playful touch that echoed the instructions on the recipe cards. I also thought it appropriate to make the recipe cards envelope out of something from the kitchen: baking parchment sheets.